Backrest adjustable manoeuvred by Screw Handle from Foot End. 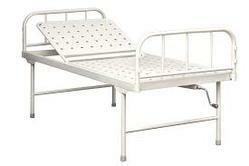 We are way forward in manufacturing and exporting Hospital Semi Fowler Bed (ABS panels) across the world. As we ensure defect-free quality products, we are entitled to receive considerable appreciation from our clients spread all over the world. These products are designed such that, various tests are conducted for the patients without any shifting to laboratory. Our products are featured with long lasting life, durability and its fine finishing edges. Our teams of skilled professionals are dedicated towards managing the production and export of Semi Fowler Bed Wire mesh. These beds are manufactured in accordance with International Mechanical Standards and compliance. 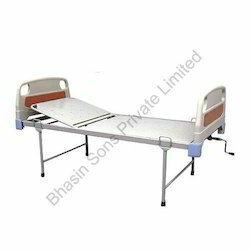 This product provides much comfort and large space for the patients to take fine rest. 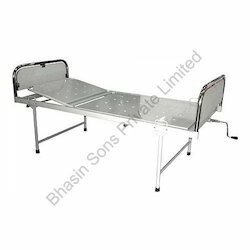 Due to the lighter weight of the product, this bed can be lifted up easily and also can be washed. Both public and private dispensaries make use of our product effectively. 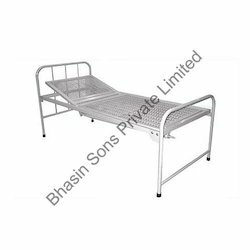 Bhasin Sons Private Limited is one of the leading companies in the field of manufacturing export quality Deluxe Semi Fowler Bed. We ensure our ranges of raw materials are procured from trust-worthy vendors. Our products are manufactured with materials which are highly consistent and corrosion resistant. The rolling adjustment attached at the adjacent end of the bed enables the user to adjust the bed comfortably. Looking for Semi Fowler Bed ?